Journalist Lili Marinkova, host of the TV show “Out of Eden” on Channel 3, explained before Nova TV that her program has been taken off air without any explanations last Thursday, and her contract with the TV was canceled. “I did my show, I could not have claims. I could complain to the Armenian priest (this is a proverb in Bulgarian, meaning complaining to no avail – editor’s note). This is a joke, because the manager (of Channel 3) is called Kevork Marashlyan (an Armenian – editor’s note). He said he did not know anything about media, as he only recently got involved in TV business, and I thought: “How can you be named Kevork and not know anything about TV,” (Marinkova was joking because a popular Bulgarian TV talk show host is also Armenian and is named Kevork Kevorkian – editor’s note). This man and some lady, who has something to do with the ownership of the TV channel, (Maria Oprenova – official co-owner of Channel 3), behave as people completely ignorant about media business and issues, which does not prevent them from managing it. They are in the role of the new owners and can very quickly destroy something that represented journalistic work,” said Marinkova. “They showed clearly that this was a matter of censorship reaction. Some experienced people would not allow this. The program did contain undoubtedly unpleasant statements. They were associated with the first moments of the career of Delyan Peevski in Varna: who ordained him, who were his godfathers; what was Emel Etem’s role. I think this is a case about the interests of people who own a number media and who feel that these media can help them gain popularity. This is absurd in Bulgaria,” added Lili Marinkova. Who or What Money Bought TV Channel 3? Channel 3 TV was purchased by “Media Investment Organization” JSC in June 2013. Regarding the means of the acquisition, new owner Maria Oprenova told Radio K2 that “this was family money – her’s and her husband’s.” According to unofficial information, the amount is estimated at 1 million levs. Maria Oprenova’s husband is Lyubomir Minchev. He is on the board of directors of the company for telecommunication equipment “Telelink”, sole property of “Telelink Holdings BV” Netherlands (formerly “SeeTech Holding”). A check of Bivol in the trade registry showed that the directors of the Dutch company are listed as Spas Roussev, Lyubomir Minchev, Yordan Popov, Yakobus Schouten and Robert Dowel. Spas Roussev, himself, is not listed as member of the board of the Bulgarian company. In the period 2011 – 2013, Telelink has won public contracts for 31,820,796 levs, a check in the website of the Public Procurement Agency shows. The company provides telecommunication equipment, software, spare parts and consumables for IT infrastructure for the Sofia City Hall, the Registry Agency, the Ministry of Health, the courts and others. The most impressive order is the one of “integrated monitoring system of the Bulgarian-Turkish border,” won by a consortium of Telelink and Indra Sistemas JSC (Spain), which is worth 28,149 242.79 levs without Value Added Tax, VAT. This contract is funded under EU operational programs and was awarded by the “International Projects” Directorate of the Ministry of Interior on May 7, 2013. Bivol approached Maria Oprenova for comments on the obvious link between public tenders and the growth of her family wealth. “I have no participation in” Telelink “and I cannot comment,” she said. Maria Oprenova confirmed that the funds for the purchase were “family money,” but was firm “Telelink” is not a family company. – Lyubomir Minchev and Maria Oprenova (in the blue oval), the new owners of Channel 3 TV. 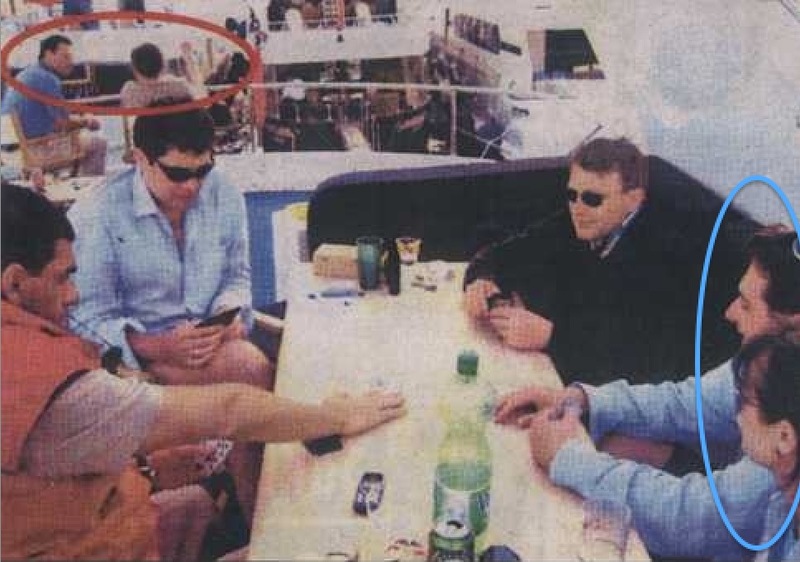 – In the back – murdered smuggler Ivan Todorov AKA The Doctor and former Transport Minister Plamen Petrov, former boss in the Bulgarian telecom “Vivacom,” which is now owned by Corporate Commercial Bank and VTB.